Facebook’s campus in Menlo Park, Calif., was the site of a protest Monday over the social network’s failure to resolve issues with its real-name policy, despite promises to do so last year. Facebook’s headquarters in Menlo Park, Calif., was the site of a protest Monday over the social network’s failure to resolve issues with its real-name policy, despite promises to do so last year. A group that calls itself The #MyNameIs Campaign was behind the protest, and Mashable and Re/code separately reported that protesters included members of the LGBT (lesbian, gay, bisexual and transgender) community (including drag queens, burlesque performers and transgender people), as well as Native Americans and victims of domestic violence. 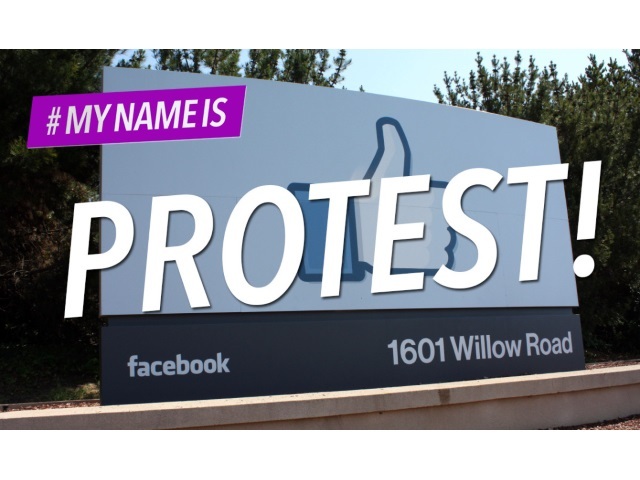 The protestors object to Facebook’s real-name policy, which requires users to use only the legal names on their birth certificates, for numerous reasons, including people who no longer go by their real names, people who are identified solely by their stage names and users trying to hide from stalkers and other abusers. People are still using the fake-name reporting option as a way to target and maliciously bully people they find objectionable for whatever reason. We were trying to get Facebook to understand that for the past nine months, and no significant changes were made. We’ve reached our breaking point. We believe this is the right policy for Facebook for two reasons. First, it’s part of what made Facebook special in the first place, by differentiating the service from the rest of the Internet where pseudonymity, anonymity or often random names were the social norm. Second, it’s the primary mechanism we have to protect millions of people every day, all around the world, from real harm. The stories of mass impersonation, trolling, domestic abuse and higher rates of bullying and intolerance are oftentimes the result of people hiding behind fake names, and it’s both terrifying and sad. Our ability to successfully protect against them with this policy has borne out the reality that this policy–on balance, and when applied carefully–is a very powerful force for good.